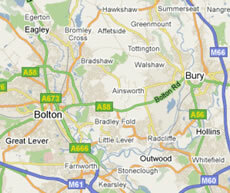 Thanks for visiting Northwest Driveway Cleaning Bolton for driveway, patio and block paving cleaning in Bolton and Bury. We are a family run driveway cleaning business with over twenty years experience in the pressure washing industry. Northwest Patio Cleaning Bolton provide affordable pressure washing for your driveway, patio, block paving, imprinted concrete drive, tarmac drive, roof, UPVC conservatory and gutters! Expert pressure washing in Bolton including Daisy Hill, Westhoughton, Chew Moor, Blackrod, Horwich, Lostock, Heaton, Ladybridge, Harwood, Bromley Cross, Egerton, Edgeworth, Turton Little Lever, Bradley Fold, Farnworth, Stoneclough Kearsley. Cheap pressure washing in Bury including Ainsworth, Summerseat, Greenmount, Walshaw, Tottington, Hollins, Unsworth, Stoneclough, Walmersley, Whitefield Radcliffe. Let us get your patio, driveway or block paving looking like brand new again with our high pressure washing systems. We offer a professional driveway patio and block paving cleaning service using modern pressure washing equipment to ensure your driveway patio or block paving get a thorough clean making them look like new again. Our fully insured pressure washing service specialises in cleaning your driveway, patio, block paving, wood decking, UPVC conservatory, fascia and gutter cleaning. We can restore your driveway patio or block paving using our professional high pressure washing system making them look like brand new again. Need your driveway patio or block paving cleaning? Call Northwest Patio Cleaning Bolton on 01204 793204. Our driveway pressure washing services includes patio cleaning, block paving, drive and path cleaning to suit your budget and requirements. Our driveway cleaning charges are tailored to your needs and being a family run cleaning business, with low overheads, we can usually beat any other driveway cleaning company quote, on service and prices, in the Bolton and Bury area. We won't be beaten on price so why not call Northwest Patio Cleaning for a free quote on 01204 793204 or contact us online and we will call you to arrange a free no obligation quote or provide more information.